The Drafts for iPad app wants to serve as the place iPad users compose text for just about anything they write. The distraction free text editor handles HTML and exports to a number of services and apps. A community of users keeps adding what they call “Actions” to extend the usefulness of the Drafts for iPad and Drafts for iPhone apps. Using Drafts for iPad ($3.99 in iTunes) writers can post short blurbs to social networks like Facebook and Twitter. With some tweaking they can add other services. Users can also export their text to DropBox or Evernote or other apps like Mail. Use Drafts to create appointments or Reminders, as well as many other actions. 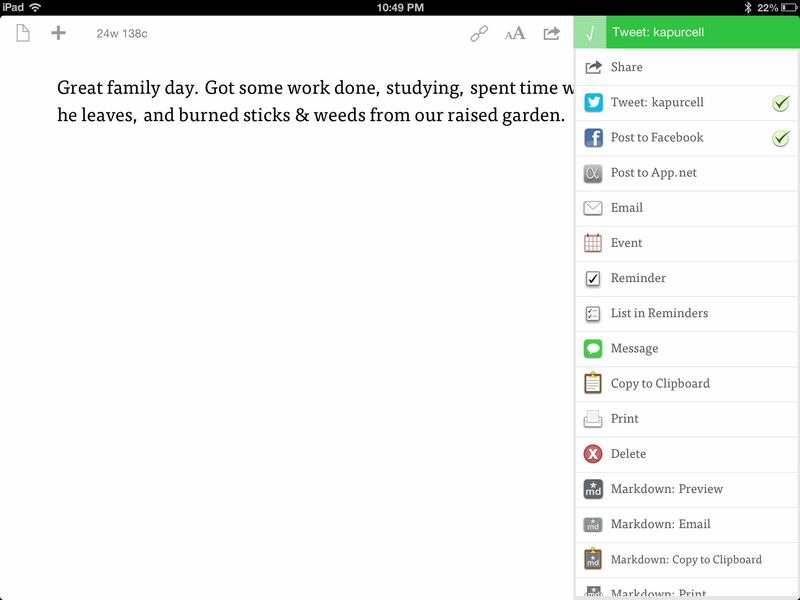 We prefer other distraction-free writing apps, like iA Writer ($.99 in iTunes). For formatted writing Pages works best. But Drafts serves as a one stop text editor for sending to all kinds of places. The simple interface lets users add punctuation marks without hitting the numbers/punctuation button on the iOS keyboard. The upper right corner shows the word and character count. The sharing button sits in the upper right. There’s a button for customizing the user interface, also in the upper right. The writer can change the background of the app from the default white with black, to text that is the opposite. There’s also Sepia. Increase or decrease font size or pick from a list of font faces. After composing text, the user can save it in Drafts and sync it with the Drafts sync service or export it. Aside from the built-in export locations, users can add more with a healthy list of customized Actions created by users. Potential users should look at the Action Directory to see if there’s a service included where they want to send text. If the users hit that link on an iOS device with Drafts installed, they can add the Action by tapping an Install button. The app handles HTML, so users who know how to code can use it to format documents from within the app. Others will need to share it to another app that handles formatting. We suspect that some people will love Drafts while others won’t understand its value. Why would anyone want to compose Tweets in such an app? It’s a love/hate kind of thing. People who prefer full WYSIWYG editors or who want total distraction-free editing will hate Drafts. Coders, or people who like to use one app to rule them all, will love it. At $4 it won’t hurt to give it a try. Users can buy cheaper text editors, but not with the added functionality built into Drafts for iPad. Also, we suspect that the iPhone version ($2.99 in iTunes) makes more sense, since the small size makes this kind of editing interface more useful. We saw a few minor problems. The app links to DropBox, but the connection kept dropping at first. Also, we used one of the Actions from the directory and it failed. The other Actions we tested worked great.